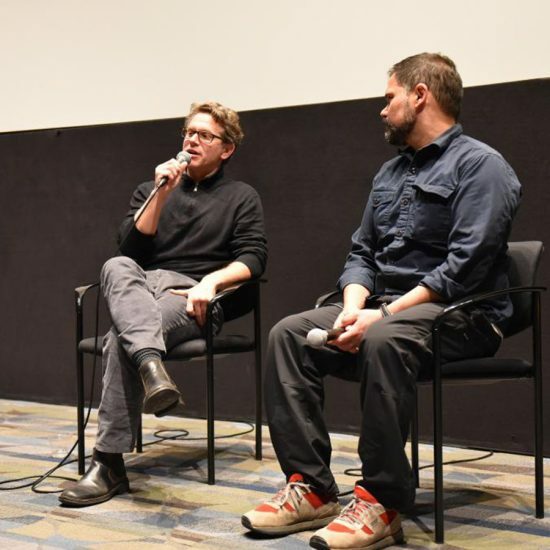 The Boston Globe’s Pulitzer Prize–winning investigative team, which was credited for cracking open the widespread clergy abuse scandal, came to Emerson College this week for a discussion following an advance screening of the new film Spotlight, which tells their story. The Bright Family Screening Room was filled to capacity with students, faculty, and staff for the November 2 event. After the screening, Writing, Literature and Publishing Assistant Professor Susanne Althoff, former editor-in-chief of the Boston Globe Magazine, hosted a Q&A with current and former Boston Globe journalists and Spotlight Team members Walter Robinson, Michael Rezendes, Ben Bradlee Jr., and Matt Carroll. Robinson is played in the movie by Michael Keaton, Rezendes by Mark Ruffalo, Bradlee by John Slattery, and Carroll by Brian D’Arcy James. Advance reviews for the film, which opens on Friday, November 6, have been positive. The film examines the Spotlight Team’s year-long investigation, concluding in 2002, which uncovered a decades-long coverup at the highest levels of Boston’s religious, legal, and governmental establishment. Carroll recalls that the investigative team “were all taken aback by the scale” of the abuse.